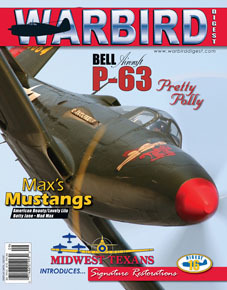 Max’s Mustangs – Like many warbird enthusiasts Max Chapman loves the P-51 Mustang. His business acumen has allowed him to explore this passion in ways that most only dream of. Throwing Rocks at a Mustang – The Bell P-63 Kingcobra doesn’t captivate the public like the P-51 Mustang, but those have had the opportunity to fly it, swear by it. Many believe the Lockheed Constellation is the most beautiful airliner ever constructed. The ‘Connie’ also served a significant role in military guise. One survivor served as General Douglas MacArthur’s personal transport. Frank Mormillo reports. Like many warbird enthusiasts Max Chapman loves the P-51 Mustang. His business acumen has allowed him to explore this passion in ways that most only dream of. Warbird Digest profiles the three Mustangs that have been part of his collection and discover how he developed his interest in warbirds. Warbird Digest’s sister company Midwest Texans is producing a series of finely restored North American Texans. Tim Savage took off his editorial hat and sat down with Greg Morehead to discuss his latest venture. The heyday of cross country and pylon racing took place in the immediate post war years. One participant was Charles Tucker who shared with Scott Germain what it was like to bend the pylons in a P-63. Dr. Joe Nelson has lovingly restored a Stinson L-5 Sentinel. Jim Russell brings the story of this octogenarian aviator who has had a passion for flight for over sixty years. The Bell P-63 Kingcobra doesn’t captivate the public like the P-51 Mustang, but those have had the opportunity to fly it, swear by it. Scott Germain talked to Jim Dale, one the Kingcobra’s biggest advocates to find out what it is like to fly the Palm Springs Air Museum’s P-63.